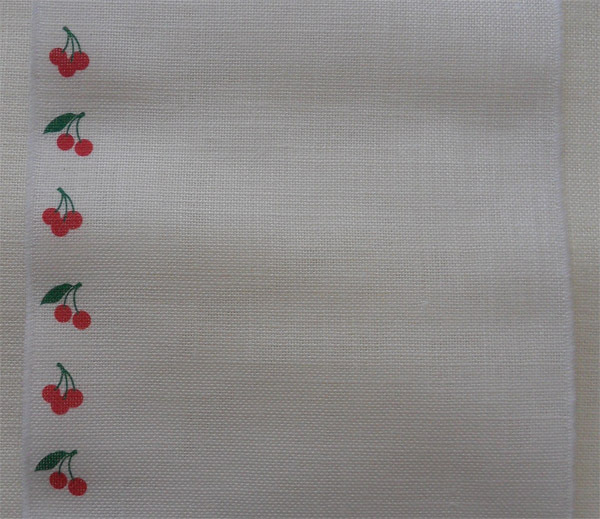 White linen band with pre-printed cherries. Another way of stitching! Thanks to pre-printed linen, stitchers enjoy an already decorated fabric for an even more original effect. 32 count linen band, colour "white"
Don't forget to have a look at our selection of hangers here. You will find many of them adapted for the pre-printed linen bands. sometimes silicone marks may appear around the pattern: this is normal and is due to the pre-printing process. They can be removed by ironing with a baking paper between the iron and the pattern. As you may need only a small quantiy of band, we propose this item by unit of 35cm (approx. 14 in). Just choose the quantity in the box below (ex: 2 if you'd like 70 cm and 3 for 1 metre). Linen band made in France.